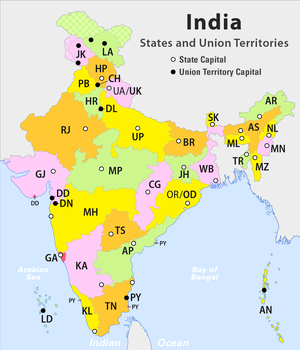 Two of the main Classical languages of the world— Sanskrit and Hindi were born in India. Both of these languages are more than 3000 years old. The country founded a religion called Hinduism, which most Indians still follow. Later, a king named Chandragupt Maurya built an empire called the Maurya Empire in 300 BC. It made most of South Asia into one whole country. From 180 BC, many other countries invaded India. Even later (100 BC — AD 1100), other Indian dynasties (empires) came, including the Chalukyas, Cholas, Pallavas, and Pandyas. 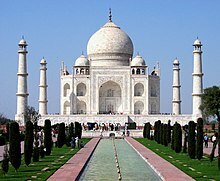 Southern India at that time was famous for its science, art, and writing. The Cholas of Thanjavur were pioneers at war in the seas and invaded Malaya, Borneo, Cambodia. The influence of Cholas are still well noticeable in SE Asia. ↑ 37.0 37.1 "Our Parliament A brief description of the Indian Parliament". www.parliamentofindia.gov.in. Retrieved 2007-06-16. ↑ 38.0 38.1 38.2 Matthew, K.M. (2006). Manorama Yearbook 2003. Malayala Manorama. ISBN 81-89004-07-7. ↑ 43.0 43.1 43.2 "Country Profile: India" (PDF). Library of Congress - Federal Research Division. December 2004. Retrieved 2007-06-24. 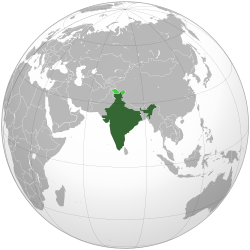 ↑ 45.0 45.1 45.2 "India - Pakistan Border Dispute". Maps of India. Retrieved 6 November 2016. ↑ 46.0 46.1 "Convention Between Great Britain, China, and Tibet (Simla Accord)". Council on Foreign Relations. Retrieved 6 November 2016. ↑ 50.0 50.1 "CIA Factbook: India". CIA. Retrieved 2007-03-10. This page was last changed on 12 April 2019, at 06:33.